Anya could really use a friend. but her new BFF isn't kidding about the "Forever" part. Falling down a well is bad enough, but Anya's normal life might actually be worse. She's embarrassed by her family, self-conscious about her body, and she's pretty much given up on fitting in at school. A new friend- even a ghost- is just what she needs. Or so she thinks. 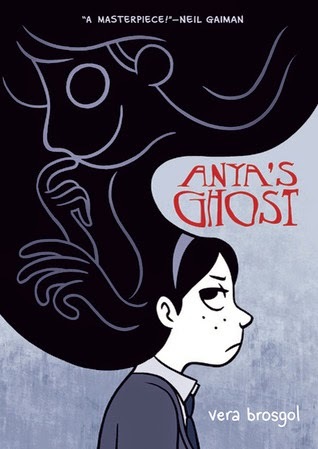 Spooky, sardonic, and secretly sincere, Anya's Ghost is a wonderfully entertaining debut from author/artist Vera Brosgol. I've recently got into graphic novels because of my profound love for Japanese manga. I thought that this one would definitely be a great novel to start with since it's been raved about on Booktube by Jessica from priceiswong. I also love scary ghost stories and a little bit of witty humor on the side. Don't get me wrong, this graphic novel was not scary at all! It's just categorized as kind of a horror graphic novel because it focuses on ghosts and basically the dead. I really thought, for my graphic novel, this was a great one to start with! It touched about many ideals, some that aimed to teach girls not to be self-conscious about themselves... unless they wanted to be haunted by a ghost that'll ruin your life! The art was spectacular. Really beautiful with a common color scheme. Some parts of the book popped more than others, but I have no complaints. It was overall so appealing to the eye and really caught me when I first picked it up! If you're into graphic novels, read The Complete Persepolis (it's actually just called Persepolis, but the complete version has every volume in one neat little book) by Marjane Satrapi. I had to read that in college and I swear that series changed my life. I'll definitely check it out since I'm looking for more potential graphic novels! If you do please tell me what you think! I'd be really excited to get someone else into that series. I absolutely adore Japanese manga, too! But I haven't been giving Western Graphic Novels a chance at all. I think the last time I read one was... umm, never >_< LOL! I'll try this one out, definitely, since I also like ghosts and paranormal stuff :) What are your favorite Japanese mangas? Attack on Titan (the main series and then there are spinoff series), Noragami, Black Butler is so good (but I read it a long time ago). That's basically all the manga I've read, but I've more animes. Great. Hope you enjoy when you read it! I'M SO GLAD YOU READ A GRAPHIC NOVEL!! I heard SO many great things about this one!! I really want to read it! I added it to the top of my wishlist, in fact! I am the opposite, I read a ton of graphic novels, but not much Manga..besides the Parasol Protectorate Manga..and a few others.. :D I really want to read this one though, and i'm so glad it was a bit creepy and you loved it. OMG that's great that you'd let me do some manga reviews!!! YAYYA. Will have to look into the Parasol Protectorate Manga!